Kingston Pike? 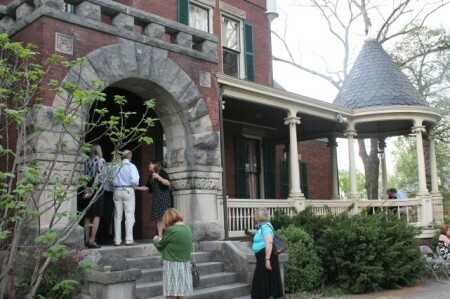 It’s just a stone’s throw to the west of UT and downtown, located among some of the oldest homes in the city. 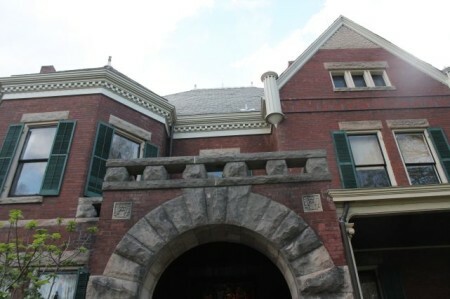 That the home behind the wall would be connected to some of the wealthiest and oldest families in the city should come as no surprise. Most people know the Crescent Bend home. 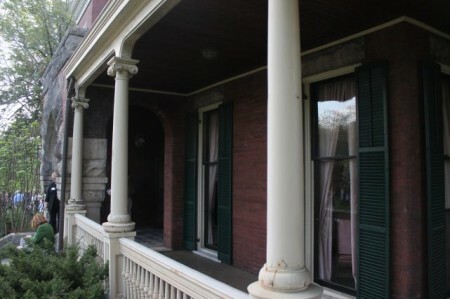 It belonged to Drury P. Armstrong who, along with his wife, moved into the home in 1834. He later gave land to his sons and Robert built Bleak House, just five hundred yards away, prior to the Civil War. 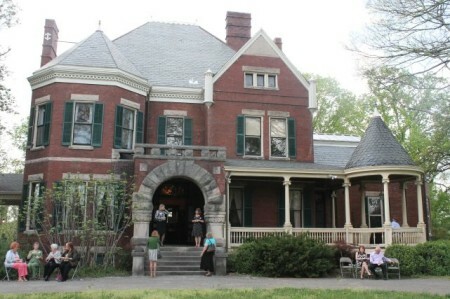 His daughter, Adelia, grew up in Bleak House and when she married John Lutz, her father gave them land across Kingston Pike on which they built Westwood in 1890. The elaborate wall was to give them privacy. 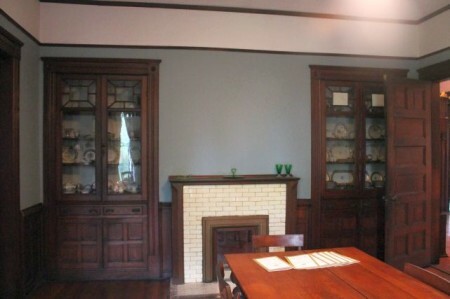 Adelia was one of the first known female artists in Tennessee and that is reflected in the home. 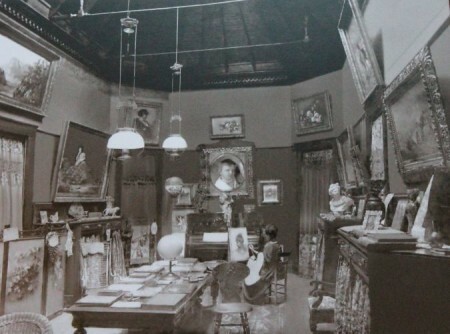 A grand room with special lighting served as her studio and a photograph sits above the mantel of her in that room, painting and surrounded by completed works lining the walls. 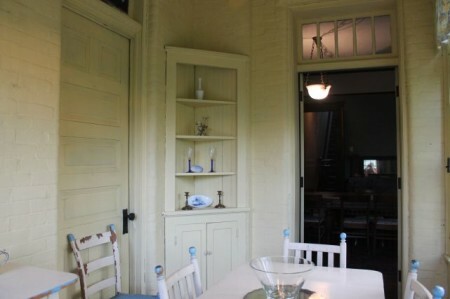 The 5,000 square foot home retains much of its original structure and architectural details. Bathrooms have been added, of course and a modern kitchen appears to be set in an addition to the back of the home. 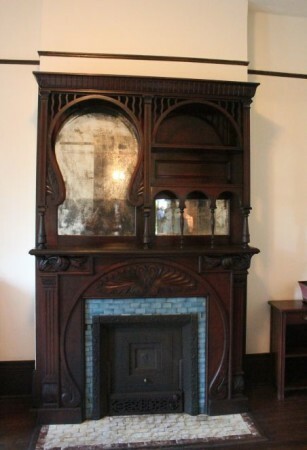 The Queen Anne home features ten bedrooms and ten fireplaces. 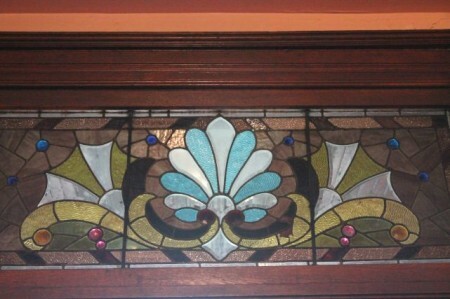 The beautiful mantels range in style and stained glass adds color above the entryway and at the top of the grand stairwell. 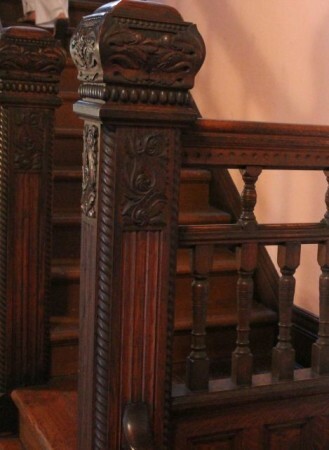 The stairwell itself features rich, dark wood with intricate designs. 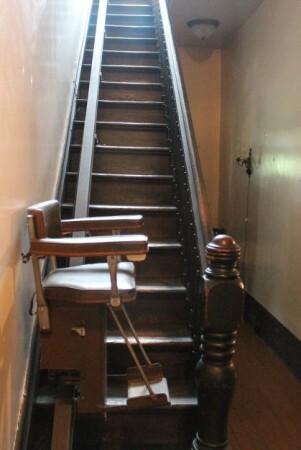 A smaller stairwell includes a chair lift. 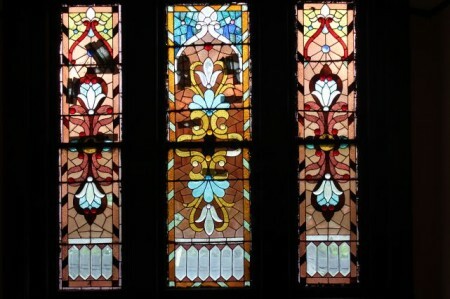 Ceilings and walls feature hand-painted designs and throughout the house original wood work, doors and floors render the home nearly frozen in time. 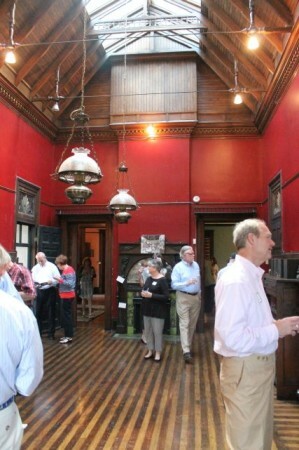 It’s easy to imagine a different world while walking the historic hallways. 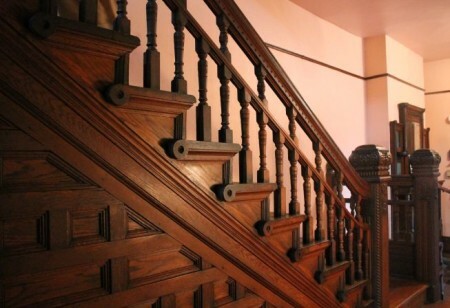 As with every great home, it seems, there must be a beautiful grand staircase and the wood on this one dazzles and delights. Ornate flourishes from bottom to top, details were very well attended to. 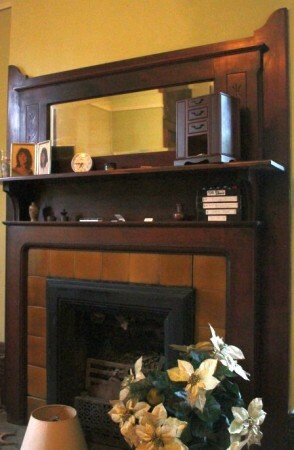 A practical built-in bench at the foot of the chair and the stained glass windows at the top add to the impact. Why did Knox Heritage choose to have an event on these grounds? Because thanks to a generous purchase and gift by the Aslan Foundation, they own the home and plan to make it their permanent headquarters, as stipulated by the foundation at the purchase. 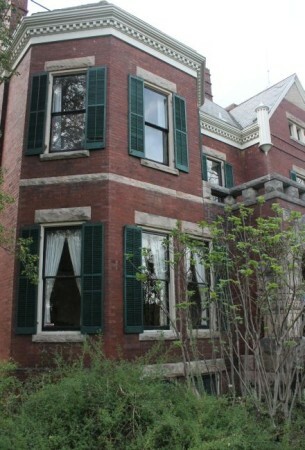 Estimates call for one million dollars to be invested in the renovation of the home, which seems modest given the size and age of the structure. 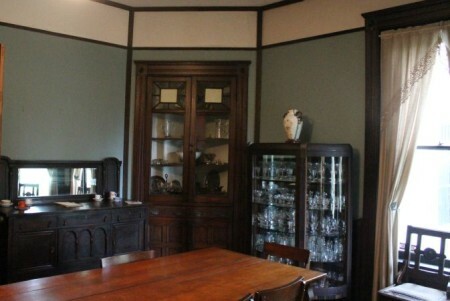 The home came available on the death of the last family member wishing to occupy the home, which was the granddaughter of Adelia and John. 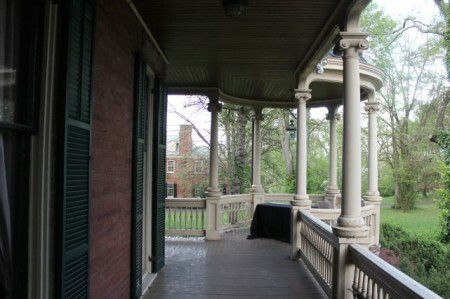 The front porch, featuring a gazebo on one end, is one of the more prominent and beautiful features. Lined by giant floor to ceiling windows which can double as doors, the spacious porch simply begs for leisurely drinks in the evening. 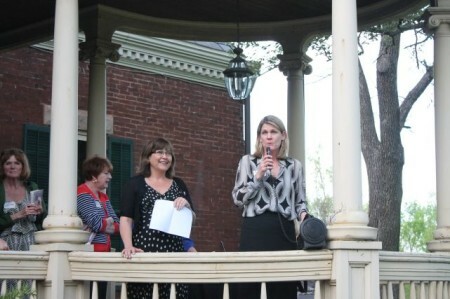 On this evening the porch saw Knox Heritage President Annette Brun and Executive Director Kim Trent addressing the crowd to encourage support for this great project. It is certainly a project worth supporting. Knox Heritage is an organization of which I am proud to be a member. They do great things for this city and I encourage you to support them, as well. Just click the link above to find out what you can do and to learn about the great member benefits – like this tour. I’ll end with a video in which Kim Trent introduces the home. Have a great weekend. My sisters, brother, young cousins and I used to play inside those serpentine walls when our parents and grand parents were visiting Aunt Louise Holloway and Aunt Cecil Matheny. Our grandmother’s sister, Aunt Dede, Mrs. Edwin Lutz, lived next door. We had so much fun hiding from each other in the huge bushes and watching Aunt Louise’s exotic guinea hens scratching on the lawn. It was there I was taught how to make a swirly skirted dancing girl out of hollyhock blossoms. 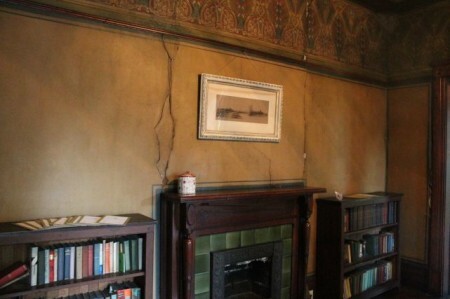 I’m so glad I found this web description of what’s happened to the property and that the house and its fondly remembered “crinkle-crankle” wall will be preserved and used to good purpose. My middle name was “autocorrected” by my “smart” phone. It should be Burwell (not Burrell). Thanks again for filling in a gap in family history. What a great story, adding a human touch to old walls. Thanks for the comment! Hey guys, I didn’t associate those walls with Jefferson, at all. 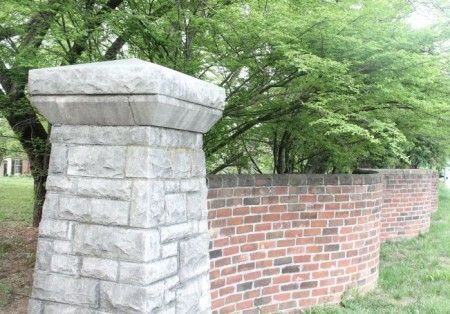 I’ve been to Monticello and UVA dozens of times and don’t remember walls like that. Did I miss them? As for keeping the horses off the lawn, I think I remember being told it was to give the couple privacy for their wedding, but I may be remembering that all wrong. Kim Trent? Very interesting link. And now that I’ve seen a photograph of the walls at UVA, I do believe I’ve seen them before, but didn’t pay much attention. Sometimes I wonder if I’m tuned in to anything. The serpentine wall at Westwood was built in 1930 for the wedding of Cecil Holloway to Albert Matheny. It was designed to provide privacy and noise reduction for the wedding on the property. It was moved closer to the house in the 1980s when TDOT widened Kingston Pike. TDOT wanted to rebuild it without the curves, but Cecil wouldn’t have it and forced them to rebuild it as it was. 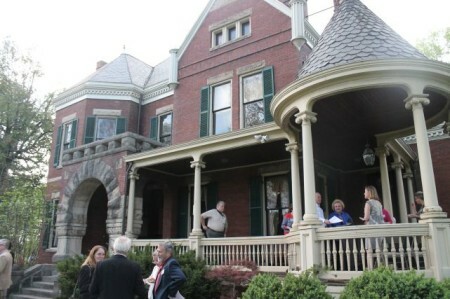 She was a tough cookie and made sure the house was listed in the National Register of Historic Places. Thanks, Kim. I knew I remembered something about a wedding. I had always heard that the wall was there to keep the horses off the lawn. Nice pics. Love the studio. Serpentine walls are a Thomas Jefferson/University of Virginia thing. I wonder if there’s a connection?